With the rousing success of the WELL Building Standard, the Green Building Initiative has launched a competing standard that emphasizes occupant comfort, energy savings, and freedom. Complimentary eye masks are just one of the perks of being LOFE2 Platinum certified. There are a number of building standards claiming to improve occupant health and well-being. Costly, complicated certifications such as WELL, Fitwel, and others place an emphasis on promoting “wellness” at the expense of what Americans want most: comfort, convenience, and freedom. A new standard from the Green Building Initiative (GBI), which administers the Green Globes certification, is out to change how we define “well” with the launch of its competing standard LOFE2 (Liberating Offices From Excess Exertion). Air: Buildings should provide enough air to maximize performance while keeping occupants conscious. As such, smoking lounges should be conveniently located by cafeteria entrances so occupants don’t waste energy making unnecessary trips outdoors. With LOFE2, there is no additional charge for breathing the many, many valuable chemicals provided to occupants for free from today’s building products. Food: LOFE2 encourages eating at your desk throughout the day to stay alert and productive and recommends foods that “stick to your ribs” so employees don’t have to get out of their chairs (see Air and Seating sections). So-called “healthy” and/or “ethnic” foods are not banned from cafeterias, per se, but buildings that offer them can have points deducted for making employees feel uncomfortable. Drink: Free eight-ounce bottled water and soda refills should be available throughout the day to maintain hydration and optimum blood-sugar levels (see Food), with trash receptacles at each desk to handle the waste and streamline efficiency. Seating: Seating should be well padded and comfortable to boost morale and productivity. Flame retardants, antimicrobials, and PFAS surface treatments should all be encouraged so “food-contaminated fabrics don’t create friction and cause furniture to spontaneously burst into flames.” The Seating criteria can be optimized by limiting potentially dangerous and distracting movements—such as standing up or talking to coworkers (see Privacy). Privacy: Similar to Seating, privacy should be encouraged to promote productivity. Meetings, “communication-friendly” areas, and dreaded “team-building” exercises should be avoided at all costs. This credit can be optimized by moving all employees to cubicles in windowless basements and installing interior door locks. Fluorescent lighting is encouraged to make coworkers less attractive. Transportation: Currently a pilot credit, Transportation encourages driving SUVs and pickups to boost employee safety and self-esteem. Additional credits can be earned by creating overflow parking lots so employees don’t have to stress about finding spaces, and by locating businesses on busy, shoulderless roads miles from bike paths so employees can speed to work without distraction. 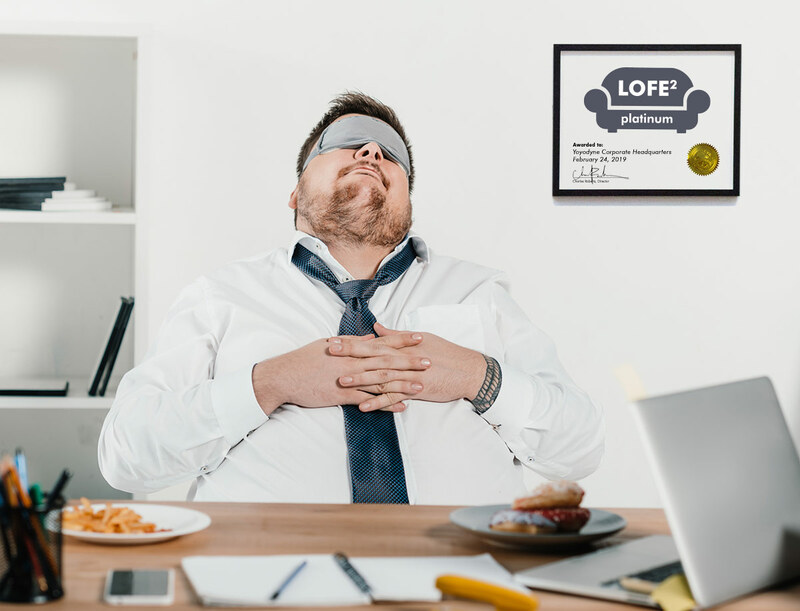 The LOFE2 standard was days in the making, engaging stakeholders as diverse as industry, employee representatives at Duffy’s Bar, industry, and Internet chat rooms. “We put serious effort into making this a robust standard that encourages well-being while not compromising personal liberty,” said Slacker. LOFE2 does not tell building owners what ventilation exchange rates they have to use, for instance, instead letting the market decide what is best.